This work presents design development and new applications of Dry Point Contact (DPC) transducers with waveguiding extensions, which serve for ultrasonic laboratory and field testing of materials. Their design allows to apply them for a number of cases where ultrasonic testing is believed to be impossible of inaccurate. Mathematical models based on solutions of the partial wave equation for different types of the waveguiding extensions are applied for optimization of their design. Their amplitude-frequency characteristics are computed. Practical aspects of application of DPC transducers and their advantages are described in this work. Nondestructive testing (NDT) methods are preferable for testing of materials and structures because they give an opportunity to evaluate materials and structures in-situ during their service, and monitor them within extended period of time. Ultrasonic testing (UT) methods occupy an important place among other NDT methods as the problems of flaw detection, testing of physical and mechanical properties of materials can be solved with their help. But there are a lot of obstacles on the way of their application, for example problems of acoustic contact between ultrasonic transducer and testing material could be considered common for a number of acoustic methods. It is possible to mention here pulse ultrasonic, acoustic emission, vibration, and impact methods. It is necessary to note that the UT methods are well developed and presented by a wide variety of tools and instrumentation. 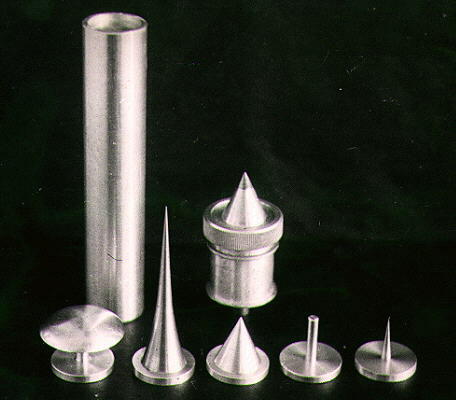 Still, there are several problems connected with application of ultrasonic methods for testing of nonmetallic or nonmagnetic materials. One of them is related to the design of ultrasonic transducers. Traditionally applicable transducers have plate contact with the testing material surface and require usage of a special couplant for creation of acoustic contact. 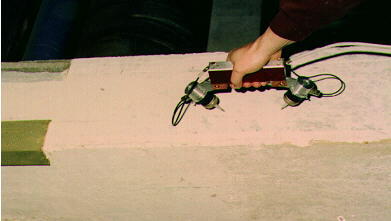 These Couplant Plate Contract (CPC) transducers have several disadvantages: couplant is responsible for instability of test measurements repetition; application of CPC transducers is hindered on rough and curved surfaces; there is a possibility of an error (commensurable with their contact area) connected with determination of distance between two CPC transducers for surface testing. Couplant free DPC transducers could allow avoiding these problems and increasing a number of ultrasonic NDT applications. Theoretical and experimental studies of waveguiding extensions for UT testing in [1, 2] demonstrated results and formulae for calculations of transmission of acoustic waves from one medium to another on the base of solution of the problem of wave propagation in finite medium. A group of researchers, who received the first positive results, rushed into practical application of DPC transducers for laboratory and field testing of composite materials and structures . Dependency of measurements of velocity of ultrasonic wave propagation on the angle of the waveguiding exte inclination to the testing material surface was also investigated. Acoustic of inhomogeneous, anisotropic or multi-layered mediums is one of the most difficult problems of calculation of physical properties of materials, such as module of elasticity of stress-strength relation. It is important to receive characteristics of acoustic wave propagation in the medium with defined law of distribution of elastic or structural particularities and make the right choices of models for calculation. Application of DPC transducers could bring a new solution for UT testing of composite materials as waveguiding extensions ensure safe and stable acoustic contact for analyzing acoustic fields point by point. Some practical applications of DPC transducers could be found in the papers [4,5]. The amplitude-frequency (AF) characteristics of waveguiding extensions for DPC transducers are very important for generating - receiving acoustic signals through testing material. Theoretic basis of investigating these characteristics is a differential equation of wave propagation in waveguiding extensions. Waveguiding extensions can be of different shapes and designs depending on the tasks of practical applications (Figure 1). Fig 1: Waveguiding extensions for DPC transducers (from left to right): exponential, conic, cylindrical, and needle shapes. Where p - excess pressure, k - wave number, S(x) - function of the cross section, x - coordinate. The variable waveguiding extension section is accepted in the shape of exponent (Figure 2). S0 - area of the base, a - shape coefficient. where: a - shape coefficient. This is a differential equation with partial derivatives, constant coefficient , and characteristic equation, where is a characteristic parameter. Assuming that waveguiding extension is excited by the excessive pressure from the side of the section S0 and loaded on an immovable and absolutely elastic body from the side of acoustic contact with material S(L) , boundary conditions will be of the following form: p(0) = p'(x,w), p'(L) = 0 . It is necessary to point out that for different combinations of a and V there is a number of critical frequencies wCRIT , below which waves are not propagating. The values wCRIT can be calculated: wCRIT ~ V · a p ÷ 2 r. Exponential waveguiding extensions have parametric high frequency resonance on frequency w0. The plots of the AF characteristics of waveguiding extension calculated according to (12) for V = 5000 m/s, L = 0.05 m and a = 0.025, 0.0125, and 0.225 are shown in the Figure 3. These plots demonstrate that exponential waveguiding extensions could be looked upon as high frequency filters (HFF) with resonance frequency w0 higher that 300 kHz and critical block frequency wCRIT in the low frequency band (Figure. 3). Fig 4: DPC transducer set-up. Fig 5: Experimental set-up: 1 - plastic box; 2, 3 - DPC transducers; 4 - probe frame; 5 - ice specimen; 6 - rubber protector; 7 - preamplifier; 8 - adaptive amplifier; 9 - ultrasonic measurement equipment UK-14PM; 10 - digital oscilloscope. Measurements were carried out using surface testing by the DPC transducers on different parts of the specimen with repeated contact conditions. The probe was manipulated by hand with load force about 1 kg. Three types of experiments were carried out with a) ice specimens on rubber protector; b) ice specimens in plastic box with water; c) water in plastic box. The experiment type (a) is shown in the Figure 6. 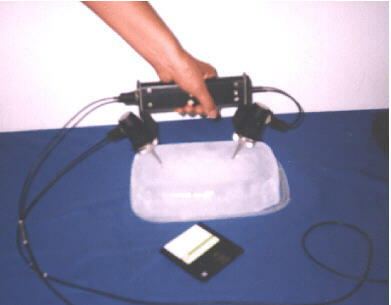 Fig 6: Ultrasonic measurements of an ice specimen on rubber protector. There are experimental data of the three types of experiments a) ice specimens on rubber protector; b) ice specimens in plastic box with water; c) water in plastic box are given in the corresponding Table 1. Basic statistical analysis of testing results for ice specimen, ice and water, and just water is presented in Table 2. Fig 7: Ultrasonic velocity distributions: 1- ice and water; 2- ice. A number of experiments were carried out to test different types of coatings using leaky waves . 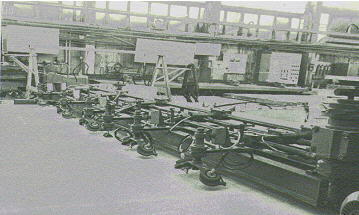 Experimental investigation of concrete slab coating is shown in the Figure.8. DPC trasducers were used in robotic testing bench for factory quality control of precast reinforced concrete structures. DPC transducers demonstrated reliable results of testing of materials with rough or curved surface and structures of extremely irregular shapes . The robotic bench is presented in the Figure 9. Analysis of traditionally used ultrasonic CPC transducers which require different types of coupling mediums to ensure acoustic contact with testing materials shows that there are many disadvantages which drive to errors of ultrasonic velocity measurement . Those problems could be avoided by stabilizing of acoustic contact during measurement procedures using DPC transducers with various waveguiding extensions. Theoretical analysis and experimental data of acoustical properties of waveguiding extensions show that their type, shape, as well as the material that they are made of, determine their acoustic characteristics and respectively their field of applications. exploration of other planets and space objects. Nesvijski, E.G. and Pochtoviic, G.Y., Waveguiding Extensions for Ultrasonic Testing of Composite Medium. Book: " Nondestructive Methods Testing of Civil Materials and Structures", Riga, Zinatne, 1982, p.59-66. Nesvijski, E.G., On the Problem of Application of the Conic and Exponential Wave Guiding Extensions for Ultrasonic Transducers for Materials Testing. Journal: NASTA Technical Bulletin, Philadelphia, PA, USA, 1997 (ISSN 1079-8498), Volume 3, pp. 49-56. Dzenis, V.V. et al., Human Tibia in the Presence of Coxarthrosis and Fracture Using Exponential Ultrasonic Concentrators," Mechanics of composite materials", New York, 1980, vol.16, No. 1, 1981, p. 17-18. Tatarinov, A.M. at al., Role of Compact Bone Tissue Thickness in the Investigation of Tubular Bones by Ultrasonic Concentrators," Mechanics of Composite Materials", New York, 1985, vol.21, No.2, p 342-357. Nesvijski, E.G. at al., "Ultrasonic Transducer". Patent SU 1298653, Bulletin of Inventors, No. 11, 1987. Nesvijski, E.G., Nesvijski, T.E., Ultrasonic Testing of an Ice Specimen by the Dry Point Contact Transducers. Proceedings: ASNT Fall Conference and Quality Testing Show Paper Summaries, Phoenix Arizona, USA, October 11-15, 1999, pp. 99-101. Nesvijski, E.G., Dry Point Contact Transducers for Transfer Technology Applications. Proceedings: 1998 International Advanced Studies Institute (Science and Technology Series), Monterey, CA, February 10-13, 1998. Nesvijski, E.G. at al., Robotic Test Bench for Ultrasonic Testing of Reinforce Concrete Structures. - "Construction and Architecture", Kiev, No. 1, 1981, p.17-18.